I Spy with my Little Eye – or do I? Once upon a time, just around when I turned seven, my teacher suggested to my folks that I should have my eyes checked. Lo and behold, the discovery was made that I was very near-sighted. That’s when I got my first pair of glasses. I remember coming home the day we picked up my glasses. We drove through winding New England roads, where the sun glints between tree branches and leaves, and I discovered, for the very first time, that it was possible to see individual leaves on trees. What always looked to me, from a distance, like a kid’s cartoon of a tree – you know the type, with a brown trunk topped with green blobs – now came to life, with quivering leaves and delicate branches. That was the best ride home ever! I could see! And while, before, I didn’t know what I was missing, now, I was completely enchanted by it. Trees with leaves. What a wonder! My enthusiasm for sight only got better as that first week in glasses went by. TV? Oh, yeah! I could sit on the couch and still see it. Chalkboards and bulletin boards at school actually had some kind of meaning to me now. And every ride home from school was deliciously detailed with distant houses, farms, people, and animals. Then, Sunday rolled around and we went to church. Our church had a big stained glass rose window at the front. Before glasses, it was a kaleidoscope of blurred colors running over on each other like backlit watercolors all merging on the same round canvas. I thought it was beautiful! So much color! When I saw it with glasses for the first time, though, I was floored. There were pictures in it! Saints and angels and stories, all there in a glorious arrangement that I could see for the first time. Eyes are important. In most cases, they are the primary receptors of sensory information for us. As we get older, our eyes change quite a bit, and that can have a huge effect on what we can and can’t do, comfortably, with our needlework. Take, for example, the Hornswoggled Project that I told you about a couple weeks ago. For that project, my initial plan was to use a 30 count embroidery linen – specifically, a Dower quality linen by Legacy, called River Stone. That’s the linen you see in the background of the photo above. It’s a great color – kind of neutral, but with a bit of a clayish pinkish natural color to it. It’s almost a putty color. 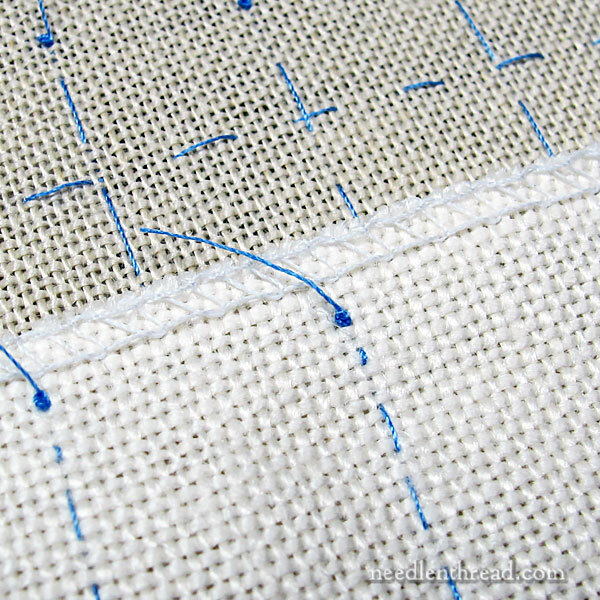 When working a project like the counted project I’m starting, and the project is covered entirely with stitches (in this case, tent stitch, which is like a half cross stitch), it’s best not to use a bright white as a ground fabric. Off white, cream, and even light browns and natural colors are a better choice, because the bright white could glint through the stitches here and there, depending on your coverage. So, with that principle in mind, and having to make a choice between a white 30-count linen and the river stone linen, I chose the river stone. When I worked this miniature Cluny tapestry project on 40-count silk gauze just over four years ago, I was able to do a good bit of the stitching without magnification. The only time I needed a magnifier was when my lighting wasn’t ideal. My magnifier (this Dublin craft light and magnifier that I’ve reviewed before) was a good option in low light situations, because it provided good light and magnification. But in really good light (like these lights that I use in my studio), magnification wasn’t necessary. Imagine my dismay when, just over four years later, I threaded up a needle and readied myself to stitch on the 30-count linen, only to find that, even in ideal light, I couldn’t see the fabric well enough to stitch. And trust me, I tried and tried! So I tried my Dublin magnifier and then I tried my CraftOptics, which I’ve reviewed as well. The more I thought about it, though, the more I rebelled against the idea of having to bother with magnifiers on a piece that will most likely take some four or five years to complete. You know, I am awfully glad I had that rebellious moment now, and not some 100 hours into the piece. So, I’ve switched linens. I’ve switched to a 25-count round yarn linen in French Bisque, which is not as white as it looks in the foreground of the photo above. It’s more of a deep creamy-golden color. 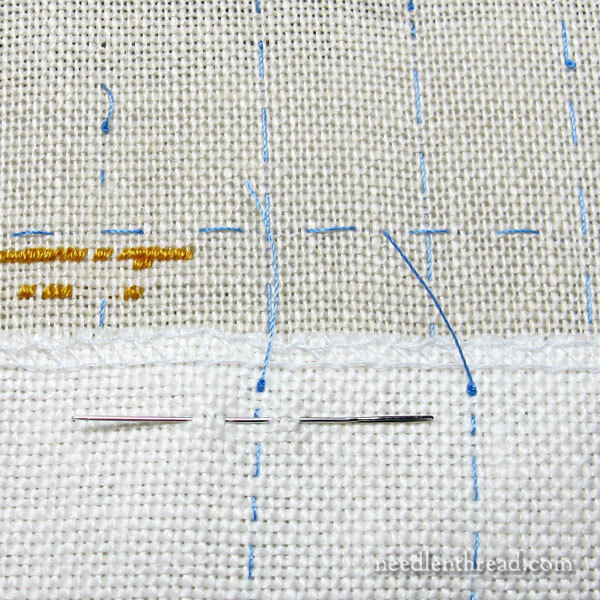 The piece of linen for the project is slightly larger because the thread count is lower, but the weave is not so large that the finished piece will look pixelated. 25-count round yarn linen (also by Legacy) is a magnificent linen. Unfortunately, this particular linen is being discontinued this year, so if you want a good 25-count linen, now’s the time to get it. Once it’s gone, it’s gone – which is too bad, because I love this particular linen. It’s perfect for surface embroidery and counted samplers. And while it’s expensive at $80 / yard, you’d be surprised how much fabric you get in a fat half, for $40. You pretty much get a square yard of linen, which is a lot of fabric! So, now you know why I’ve switched to the 25-count linen for this crazy project. I blame it on my eyes! But the nice thing is, I can see the 25-count linen easily, without magnification, which will make stitching much more comfortable. On that point, though, remember – if your eyes are uncomfortable and you’re having a hard time seeing your fabric – don’t force yourself to keep working without some kind of visual aid. Sometimes, it’s just a matter of increasing your lighting, but other times, slight magnification might be necessary. The latter can be achieved a number of ways, including using over-the-counter reading glasses, if that’s all it takes. Whatever you do, don’t strain your eyes. You only have one set of eyeballs, and they’re worth taking care of! Mary I had to laugh as my near-sighted experience was so similar. I remarked, quite surprised, at the number of dead people in the New England cemetery after I got my glasses. Magnifiers are a way of life for me, particularly after a retinal detachment a few years back. Even in my 30’s I need them to do any sort of detail work and I find they strain my eyes far less as a result! I look at the 36-count fabric I used to be able to stitch on unaided until twenty years ago and sigh! Fortunately my sight is still equally good (or bad)in both eyes, and I can still get away with 2.00 ‘ready reader’ glasses from the supermarket for normal office work and reading. (I use 2.50 for less good light or not-too-fiddly close work.) I have a great Purelight LED magnifier/lamp for embroidery but I only use it for the light. I sit much too rigidly when I am looking through the lens, and I get cramped. So now I simply stick a second, stronger, pair of reading specs on my nose, on top of my normal ones and ignore any funny looks I get – problem solved, and it’s a very portable solution. Yes, yes, take as much care of your eyes as you can! Usually when I can’t see my work clearly it’s because of bad lighting, especially when I end up embroidering in the late afternoon to evening when the natural light is fading. Dear Mary, I know just how you feel. My very first big needle painting project, was the two quails I did for my friend Roby Baer. It was one of her paintings and was to be a gift. I worked the whole image just with my glasses, no problem. The following year I did my little tortoise eating a strawberry. I started this project while I was visiting my son. Once at home I looked it over with a magnifying glass and to my horror I found tiny little gaps everywhere. Luckily Trish Burr sang the praises of using a magnifying lampin one of her news letters at the same time. I promptly went out and bought a circular one. Best purchase ever. Now I can do the tiniest of tiny stitching and no gaps. The beauty of a circular lamp is, it does not make any shadows on your work. Yes it is very important to look after your eyes and I want to embroider for many more years. Kind regards Elza Cape Town. I completely agree with the eye-sight thing. I am still fortunate enough to be able to do even very fine work in good light without magnification. And I do remember trees getting leaves when I was about ten and needed glasses, LOL. My grandma switched to crossstitching when she became older and was very productive. In the last years of her life, she couldn’t see well enough anymore not even with magnification (those magnifiers weren’t as good back then as they are now). So granny came up with her own solutions. Too many colour changes in a piece were simply toned down :). Butterflies got two wings crossed off :). I love these pieces to bits as I know how much it meant to her to keep stitching for as long as she could. And I can see myself producing handicaped butterflies in 50 years or so. P.S. Did the book ever arrive? Otherwise I’ll need to chase that up. Oh to see once again all those detailed shapes instead of fuzz wonderful. I need glasses and when sewing I need a magnifier, I couldn’t sew without one, I can’t thread a needle clearly without one, especially as I’ve got older I need every aid possible. I don’t find it cumbersome I sit in front of my frame and my Dublin Craft light and magnifier stands beside me and I’m ready to sew and when I’m not using the magnifier it stands in a corner next to my frame hidden from view so I don’t notice it, but I do wish I didn’t need it as I remember when I first started needlework and I used to sit on my settee in front of the telly and happily sew away at my crosstitich. Those were the days. thanks for sharing your thoughts on I spy with my little eye, I remember playing the game for hours as a child with friends and family really enjoyed it. Looking forward to your progress on this project. With my first glasses at 18 (somehow got through school rarely being able to read the blackboard! )I chiefly remember noticing for the first time how dirty the sidewalks were as I came out into the shopping centre! When I first read your article on this piece and you said you were going to use 40 ct I thought you must have suffered a severe head injury…lol. seriously, 40 ct? in IMHO 30 ct is just as bad as 40 but different strokes. I’ve used a magnifying lamp for many years but that was for the charts, not the fabric. a couple of years ago I came to the realization that my eyes were getting too bad to do 18 ct…and was trying to coming to grips with the thought of having to go back to 14 ct. I had tried the clip on magnifiers that went on top of normal eyeglasses without much success. one evening while at a stitch in, one of the ladies had this “thing” on her head. I asked what it was and she told it was a MagEyes magnifier. I asked to try it and was hornswoggled (you word…G) that I could see 18 ct very well. anyway, long story short, I bought one from amazon http://www.amazon.com/MagEyes-Magnifier-5-7-Lenses/dp/B000WUY8NS/ref=sr_1_1?ie=UTF8&qid=1443628867&sr=8-1&keywords=mageyes . I’ve never regretted it and enjoy stitching on 18 ct again. I am finally biting the bullet and getting new lamps. I had decided on an Ott light and was thrilled to see todays post. I reread your review of the Blue Max from a few years ago and wanted to know if you still felt the same way or if you have updated your opinion? Hi, Maureen – yes, I still love my BlueMax lights! They’re the best! I do have one problem with the floor light – the switch is giving out a little, so it takes some fiddling to get the thing on or off now and then. Sometimes, it works fine, other times, I have to mess with it to get it to click. But it’s only on the one light, which I’ve had for quite a while. The other two are working just great! *grins* Right now, I keep complaining about ‘that person’ who bought my current cross-stitch project. the fabric is 16 or 18ct navy aida, and while I love how it’s coming along, I have *no idea* why I thought I’d be able to see holes that tiny in cloth that dark. Even under my Ott light, I have to take a break and rest my eyes. Of course, I think I bought this piece 10 years ago – that may be why I didn’t think I’d have any problems seeing it! Yes, I do that. When I’m in front of the tv (my Ott light is in the living room), I have a yellow quilt I lay on my lap. When I’m in my bedroom, I often use the light of the laptop to ‘backlight’ my stitching, hah!. My first pair of glasses came when I was about 12. I had gone to a drive-in with a friend and her parents to see “Whatever Happened To Baby Jane”. It was so blurry and I was so bored, bored, bored because I couldn’t see what was happening. I encountered this problem when trying to cut fabric. I just couldn’t cut fabric at the correct size with any consistency. I purchased a fabric die cutter and life is so much happier now. P.S. I have re-watched the movie. It’s quite good! Ah yes our poor, poor, eyes! This is why I can’t do any kind of counted work, as I literally go cross-eyed trying to do it. Even moving to progressive lenses this year for my glasses hasn’t helped in this capacity. Same as working in lower light conditions. I avoid doing needlework in the evenings. As much as I love embroidering, avoiding eye-strain is just too important to push it in less than ideal situations. Two years ago I had had it with the craft optic glassses (too heavy) and magnifiers on stands or around the neck (bulky & clumsy) and store readers. Nothing helped so that I would sit comfortably and not tense up my shoulder muscles while squinting to see my fabrics. I went to my eye doctor and told him the problem I was having, I even brought a sewing project so he could see where I held my work and where I wanted to work. He provided a prescription and I got my sewing glasses and I absolutely love him for taking the time. I now have 4 pair – 1 in my purse, 1 at the sewing machine upstairs, 1 at the sewing machine downstairs, 1 at my living room chair. They are not beautiful frames (except for the one in my purse which is bright red!) but they also didn’t cost an arm and a leg. I don’t have to bend my head at the sewing machine – I CAN SEE – I don’t have cramped shoulders – I CAN SEE and I can read a book/instructions easily, just don’t ask me to look up and recognize you. So another option is prescription sewing glasses just for you. You are so right about vision and taking care of your eyes. I am on bifocals now and have leaned the importance of taking “eye beaks”– looking up from your close work regularly and frequently to let your eyes refocus. I have so admired that tapestry piece and been really tempted to try it. Forty count silk gauze seems like a huge challenge though, and I have wondered about doing it on a smaller count linen. I hadn’t thought about the term “pixilated” before, but that is what I am concerned about. Having done the piece, what is your opinion about what count linen could be used while preserving its beauty? I don’t remember my experience being as exciting as yours – trees did not look like blobs without glasses until sometime later in life, I remember how clear and sharp everything looked and how I would have this experience with each new pair of glasses as vision changes progressed. When I got (old fashioned hard) contact lenses in high school it was even more exciting. As I have explained to my husband without glasses I see a green lawn, with glasses I see grass, with the contact lenses (no longer worn) I saw blades of grass. I reached the point maybe 10 years ago where I now need reading glasses. Strangely even before same as well as since, I find the best thing I can do is take off my glasses and work without them. I see much finer detail without the glasses on very close items. I have to hold the work maybe a foot away (so when demonstrating in the 19th century and using a floor stand I have to muddle through with glasses – repros – on, in the 18th century with a hand hoop, the glasses – repro for then – come off.) I tend to do embroidery as well as reading books without glasses. From what I have read aging in the 18th century (and I would assume in centuries prior to that, and probably until the use of electric lights – or at least gas lights) there was an additional problem as one aged in seeing to do needlework and many women had to give up doing so after age 40 as the light was not sufficient for their eyes to see the detail. I use this in my 18th century interpretation mentioning that I find that if I am not outside I have trouble seeing to work. So at least we have plenty of light to help our aging eyes. Actually, historical masters of needlework and scribes/illuminators were almost always very nearsighted. The convent/monastery would have been the only viable option for most people who couldn’t see past the ends of their arms. If your vision wasn’t good enough to be meaningfully productive in an agrarian setting and you weren’t the child of the very wealthy you would have been a burden to your family. The Church would feed and house you and teach you to do the fine work labors. It was very counterproductive to teach the fine work to people who would have to give it up about the time they reached Mastery. I appreciate the info. Near sided people (which is what I have been since grade 2) have the advantage of seeing for close work. In my comment, I was mentioning the average woman who had to deal with the sewing for her household – although for many, many this meant supervising the servant(s) who did the actual sewing work as due to “an oversupply” more people had at least one servant than we would think – as well as her “fancy” work if she knew how to do same and had the money and inclination to do so. My experience with glasses was exactly the same. When they put them on me (at about ten years old) I fell off my chair! To see leaves on trees blew my mind, and stars and the moon, too. Thankfully needlework and reading are about the only two activities I can do without my glasses. I worked in ophthalmology for a couple of decades and was also holy wow nearsighted until having cataract surgery (which is effectively refractive surgery – not a bad thing!). I have surgical loupes (which are where the nice people CraftOptics got their start – – at about four times the price he’s now charging). Good light and good optics are never to be underestimated!!!! I’d be happy to do a guest piece on explaining your visual demands to the eye care providers. Getting them to understand what you want to see is often harder than it needs to be. Thanks, Robbie – I sent you an email! What kind of clip-on magnifiers do you use, Kilmeny? You mean they clip on over your glasses? I had my daughters eyes checked from the time she was 3 years old. Yes they can do that quite easily and without any pressure on your child. I also went to Art School with a friend whose daughter (at this time 13 years old) had always struggled with school work yet was a bright intelligent young woman. They had paid a fortune for tutors and when her mid-year report came in it was appalling. Husband lost the plot and my friend is at art school crying. I asked ‘Well of course you’ve had her eyes tested?’. Yes she says, the nurse at the childrens clinic checked and said her sight was fine!? Pardon. Go to an optometrist, now. Next week at school she had a photo for me showing her daughter wearing jazzy red glasses. The poor kid had never had any distance sight. Just kept saying I thought everyone saw things the way I do. I didn’t know you could see the actual leaves on a tree. You get the idea. Husband, duly guilty for his behaviour, mother at peace and relieved and a daughter that by the end of the year aced every subject in school. Have you eyes checked and your childrens, every year. And don’t wear el-cheapo glasses bought in a supermarket to do any kind of fine work. Eyesight generally deteriorates at different rates in each eye. Strain is the worst thing to bring on diminished eye-sight and will lead to glasses before their time. I too am very near sighted (can’t see past about 6 inches) and simply take off my glasses to see close. It works much better than magnifiers. Or at least it did until one eye has started going more farsighted than the other in its old age, now I have about 1/2 inch range where both eyes are in focus 🙁 And the bifocals are OK for reading, not for needlework. My vision revelation that the world was not a blur was as a child, at a drive-in. Apparently I could not see the menu (no wonder I always ordered the same thing!) and I was made to try on sister’s glasses. I did NOT want to give them back, but also did not want to wear glasses. Seeing clearly finally won out. I also had terrible eyes, which in the last few years started getting worse. It turned out that I had fast-growing cataracts, and it got to the point where the only thing I could see to do was knitting or crocheting. Back in 2011, I had them fixed and with my new built-in lenses, I only need reading glasses now at a 1.25-1.5 magnification. When I’m stitching, though, I sling on a pair of 3.5 magnification glasses to see the holes well enough. This works really well for me, and even when I wore glasses all day every day, I used to “double-glasses” myself and put the magnifiers on top of my regular specs. Since they were Progressives with a built-in magnification of 2.5 so with the extra glasses, I was seeing huge holes! I also figured who cares if I looked weird with two pairs of glasses, I mean who’s looking at me anyway? I agree with Mary, use what you gotta use and who cares if it makes you look a little … odd. I was about six when I got my first pair of glasses and I still remember the whole new world I discovered. Now I have astigmatism and glasses don’t do me much good when I’m working at my embroidery. My eye dr. insists that I’m not damaging my eyes by not using my glasses, but I wonder. I’ve tried magnifiers but they don’t work for me because my eyes are radically different and all they do is start a war with one another. This getting older certainly isn’t for the faint of heart (or the weak of eyes!!). Oh Mary, I feel your pain. That happened to me quite a few years ago. I sometimes consider getting one of those 5,000 wat kleig lights. I had a similar experience as a child and was amazed how much better things were after I had eye surgery. You were wise to go with the different count linen.